No. 4112-F(J)-W.B. Dated: Kolkata, the 1st November, 2018. 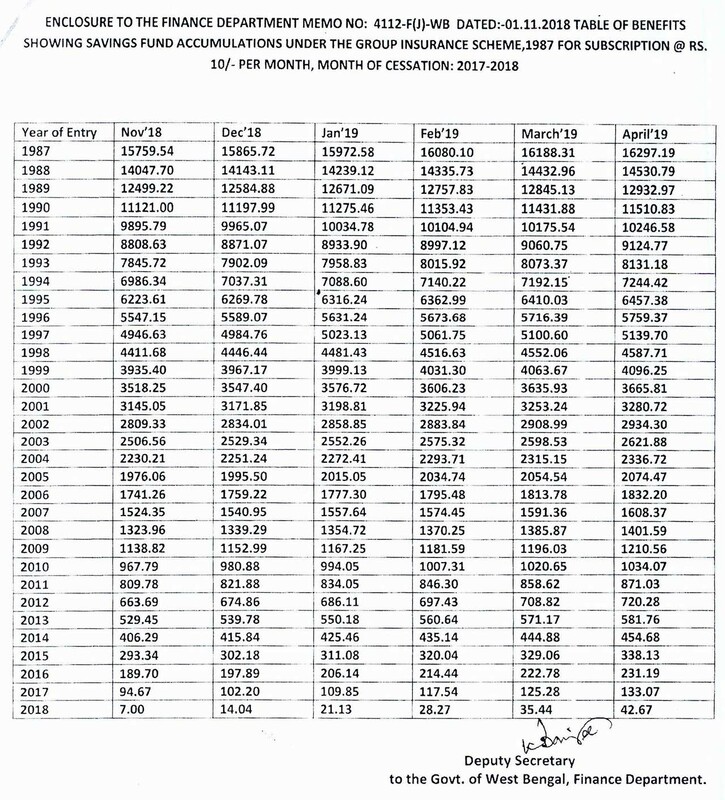 SUBJECT: State Government Employees Group Insurance Scheme, 1987 – Table of Benefits under Savings Fund for the year of cessation of Membership 2018-2019. In continuation of this Department’s Memo No. 1554-F(J)WB dated 04.05.2018, the undersigned is directed to say that a new table of benefits showing accumulation of savings fund under the above mentioned scheme corresponding to a unit subscription of Rs. 10/- (Rupees Ten) only per month has drawn up for the period from 01.11.2018 to 30.04.2019 in matching with the Central Government Employees Group Insurance Scheme, 1980 circulated under GOI’s OM No. 7(2)/EV/2016 dated 25.05.2018.